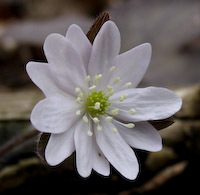 The two Hepaticas are very hard to tell apart without their leaves. 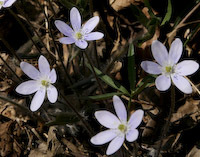 Their respective names tell it all: Round-lobed Hepatica (Anemone americana) has round-tipped leaves, whereas Sharp-lobed Hepatica (Anemone acutiloba) has pointed leaves. Without their leaves, these two species are identical.